A small bonus from work allowed me to pick up a few books which have been on my want list for some time. Yeah, I have eclectic reading tastes. From top to bottom, they are: New Kind of Rebellion, by Rachel Gleason; The Black Tides of Heaven and The Red Threads of Fortune by JY Yang; Ambiguity Machines by Vandana Singh; Afrofuturism by Ytasha L. Womack; New Poets of Native Nations, edited by Heid E. Erdrich; and The Rise and Fall of D.O.D.O. by Neal Stephenson and Nicole Galland. Between work, vacation, and illness, and recovering from all three, I have missed a few weeks. I have also missed you-all! Welcome back. * This is a great list of over 100 Russian writers, past and present, who are worthy of consideration. * An excellent MetaFilter post from user Kliuless, offering a huge list of links concerning the concept of authority, narratives, cultural inertia who we allow to write the stories in which we live. * Speaking of Metafilter, here is their latest post concerning the increasingly despotic and idiotic tenure of the fascist bootlick Donald Trump. Many worthy links and news sources in the comments. * The Calvert Journal is publishing Beyond the Game, a series of video vignettes exploring each of the cities in Russia which will be hosting the football during the 2018 FIFA World Cup. ** All the new Fantasy Books Coming Out in June 2018. ** All the new Science Fiction Books Coming Out in June 2018. ** All the new Genre-Bending Books Coming Out in June 2018. * Metafilter has posted the latest catch-all thread for links and commentary concerning the presidency and administration of Donald Trump, whose daddy issues exceed even those of George W. Bush, which is an astounding accomplishment. Baby Hands and Daddy Issues would be the title of the most accurate possible biography of our current and perpetually emasculated president. Several years ago I began collecting books from publishers who specialize in translations from other languages into English. This was prompted by two circumstances. First, a co-worker from bygone years, Chad Post, began working at Open Letter Books in Rochester, NY. Second, on a visit to the Grand Rapids Public Library I discovered Esperanza Street by Niyati Keni, published by And Other Stories. My eyes having been opened, and knowing a thing or two about the publishing world, I began researching small presses and books in translation. This led to the discovery that some of the most successful publishers, with the most exciting titles and authors, offered subscriptions to their catalogs. What a wonderful way to discover new authors, support small businesses, and add quality and variety to a personal library! As of the publishing date of this post, I have subscriptions to Open Letter Books, Restless Books, Deep Vellum, & Other Stories, and Two Lines Press. I found a couple of pages which have comprehensive lists of publishers of works in translation – The American Literary Translators Association and PEN America. What follows is a subset (probably incomplete) of publishers from these two lists which offer subscriptions to their catalogs. Links go to subscription information. * A worthy list from BookRiot: 50 Must-Read Books with Gorgeous Writing. From this list I have read The Ocean at the End of the Lane, One Hundred Years of Solitude, The Kite Runner, and White Oleander. 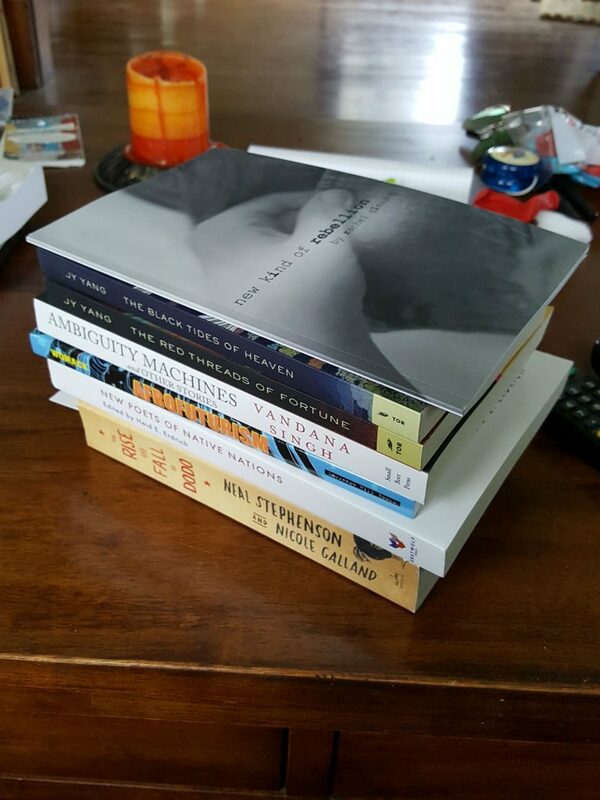 Looks like my Mount Tsundoku will be growing soon. * The Midwest Socialist has published an excellent 5-part (so far) primer on the basics of radical thought and history. * Goddammit so much. Anthony Bourdain has left the kitchen. Here is a good round-up of the best writing about Bourdain to be found on the web. * Some words: Dialogue. Monologue. Analog. Dialect. Lecture. Lector. * After some years of using GoodReads, I am trying out LibraryThing as a way to catalog all of my books. I can’t say I prefer one to the other, but at first use the LibraryThing UI is easier for viewing large volumes of data. Thus I don’t need to build a custom app to do this for me. Plus plus, the LibraryThing Android App can scan barcodes, which VASTLY simplifies the cataloging process. * [UPDATE] After a week of using LibraryThing, I can say this: LT is very good as a cataloging system. It lacks some of the “friendliness” of GoodReads, but that is not a criticism. LT also makes sorting, filtering, and categorizing extremely easy. I think I will end up using both in parallel – GoodReads for the more public-facing view of all things literary in my life, and LibraryThing for the catalog of my personal library. LT will also be useful for outputting data for any custom apps I might build down the road. * I’ve been studying up on Baba Yaga and Russian history for a writing project. One of the odd bits of trivia I have uncovered is that there is a community of Old Believers in a tiny town in northern Minnesota. Old Believers — staroveri (старове́ры), formerly called raskolniki (раскольники), which has interesting connotations vis a vis Raskolnikov from Crime and Punishment — have communities all over the world, with the primary U.S. populations being in Alaska, Oregon, and Pennsylvania. Funny, the way the pieces of a story come together. * Back in September of 2016 I took the Amtrak from Grand Rapids to Vancouver via the Empire Builder route. It was a wonderful, contemplative, transcendent experience (blog posts pending). Based on that, and based on this article in the Calvert Journal, I now want to experience the Trans-Siberian Railway. It will also give me an excuse to dust off my Russian skills. * And speaking of that trip, while in transit, while not watching America roll by, I read Trysting by Emmanuelle Pagano. It is an absolutely beautiful book, recalling all of love and beauty and intimacy and trust and heartache and the million tiny moments that bind people together and pull them apart. I just came across a wonderful review by Lauren Goldberg in Music & Literature which does justice to the most compelling book I have read in years. On a related note, I think I will now buy a subscription to Music & Literature. * And speaking of Russian stuff, the Speak Russian Like Russians blog is both useful and fun. * In the world of fandom and literature, author Jim C. Hines (may his beard grow ever longer) has put together an excellent post detailing the long history of Jon del Arroz’s trolling and harassing behavior toward authors, fans and organizations in the larger community. The comments on the article are mostly erudite and informative, though a JdA supporter/GamerGater pulls an impressive amount of sea-lioning to no significant effect. * The 2018 State of the World conversation over at The Well has wrapped up. It, as well as the many previous conversations in the series, are well worth perusing over the upcoming weeks and months. A hearty thank you to Bruce Sterling, Jon Lebkowsky and all the other participants for opening this to the general public. * Dean Allen, creator of the content management/blogging system Textpattern, has passed away. Allen was one of the biggest influences in my early career as a web developer. I took his thoughts on design and typography to heart, though I was never a designer. His photo blog featuring his Weimaraner Oliver made me want to move to rural France. Allen, along with Eric Meyer and Jeffrey Zeldman, were huge influences as I began my career in web development.